Got this guitar just over a month ago. 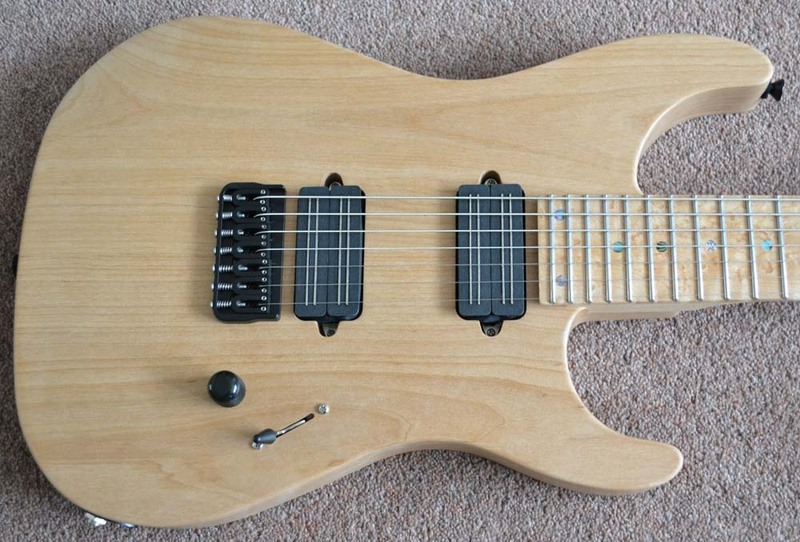 I've played several 7 string guitars in the past but WOW does this one stand out. Aside from the lovely natural finish and the great grain on the body, the hardware really completes this axe! The neck is super fast and easy to manouver round and the string spacing is just right for my style (not too close together so i dont clip other strings as i fret). I think the BKP Blackhawks were a nice selection for this axe as they not only look cool but god do they sound awesome! They have a warm and full clean sound that splits well into a "strat on steroids" tone but then roll the volume up and kick in the gain and they really come alive! The guitar screams! The notes flow evenly and smoothly whilst still remaining distinct and clean on the neck pickup and the bridge is edgy and tight with great bass reponse. In short this is one hell of a guitar and i liked it so much that i've ordered a custom version of it to be made soon.